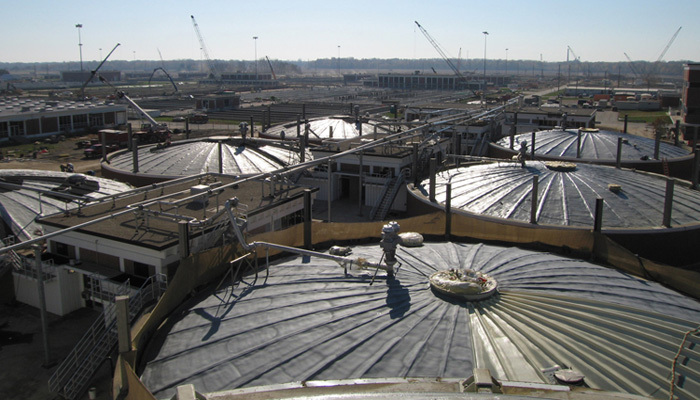 FoamCoat Roofing and Coatings was contracted to install an average of four inches (4”) of polyurethane foam and urethane coating to eleven digester covers at the Columbus Southerly WWTP. The project totaled roughly 50,000 square feet. Coordination of the scheduling was very critical for the project due to various stages of work that had to be completed prior to the installation of the insulation, and the sequence of tests that followed upon their completion. The preparation and pressure testing required prior to the insulation was the biggest challenge as it took a minimum of 9 days per digester. 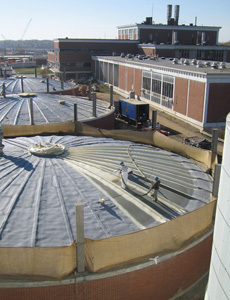 FoamCoat was contracted in late August with the target completion date for the digesters to be operational January 2009. 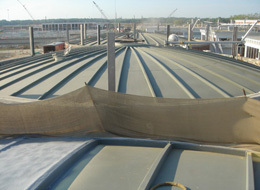 The digester covers had 6” braces with larger lips. The foam was filled and tapered to provide proper drainage. 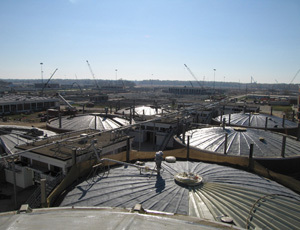 Walkways were also built into the top of each digester. Granules were added to the coating at the walkways to improve traction. Even with some delays in the testing process that impacted FoamCoat’s start schedules on the digesters, FoamCoat completed the job ahead of the construction manager’s schedule and “on spec”.